Gather the ingredient for making kimchi jjigae. Then read the tricks found here. Use one package of dashima or create your own with 6 large anchovies and to strips of kombu sea kelp 3in (7.5cm) long. Soak the dashima for 20 minutes in 1qt (1lt) water, bring water to gentle boil, and boil for ten minutes. Cut the pork belly to 1 1/2in (3.5cm) strips. Cut the kimchi to 1 1/2in (3.5cm) strips. Fry the pork for about 10 minutes. You want the pork to stick to the bottom of the pot turn the bottom of the pot brown for flavor. When the pork is finished cooking strain it to get rid of excess fat, then return to the pot. Add kimchi and fry the pork and kimchi together for about 3-5 minutes. More browning will continue to develop on the bottom of the pot, and this is ok.
Add prepared dashima water to the frying kimchi and pork. When you add the water, it will loosen up the stuck on brown stuff, and will make the stew more flavorful. Agitate the bottom of the pot with a spoon to release the browning. Bring the jjigae to a boil and add the onion an mushrooms. Add about 1 tbsp of gochujang. Add about 1 tsp of sugar, and 1 tsp of kosher salt. Finally, add tofu during the last two minutes of cooking. 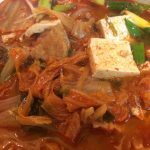 To make Kimchi Jjigae, start by preparing your ingredients placing them near the stove where you can work each step. Have a big and deep enough pot. Once your assembly line is ready, then follow the instructions.